The Weekly has been having fun interviewing a cadre of Tahoe locals and transplants who are doing their best to be a part of the upcoming Winter Olympics in Sochi, Russia. Recently, I was given the opportunity to spend a bit of time with Joe Pete Wilson, who competed for the United States in the cross-country events in Tahoe’s own Olympics more than 50 years ago in Squaw Valley. Later, he went on to live an influential life in the history of cross-country skiing in America. 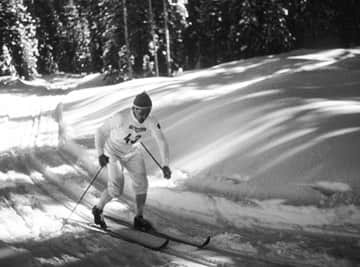 Known as the King of Skis in 1960, Sixten Jernberg of Sweden won the gold medal in the 30-kilometer (18.3-mile) race. Despite his later starting slot when the course conditions were slower, Jernberg’s elapsed time was 13 seconds better than his next closest rival, teammate Rolf Ramgard. Wilson grew up in Lake Placid, New York. A place that Wilson says is just like Tahoe: kids dream of growing up to become winter Olympians. 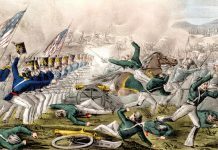 “I had the good fortune to be named to the U.S. Ski Team in 1959,” he says. 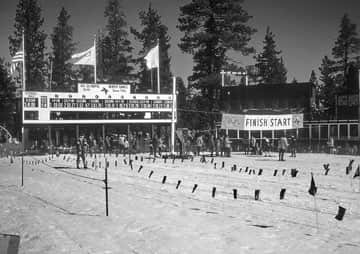 He was sent to work in Squaw Valley to try to find a place where it was feasible to hold a cross-country ski race. He found the valley to be an enjoyable place to cross-country ski, but felt that the area around Squaw Valley was either flat or steep, and didn’t have the rolling terrain needed for a cross-country race. 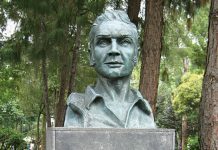 So, he and others developed a system of trails on the West Shore of Tahoe in the McKinney Creek area, now home to Sugar Pine Point State Park, and the neighborhoods of Kailua Park and McKinney Estates. The scoreboard at the McKinney Creek stadium forecasts what will be the final results of the 50-kilometer race even though the competition is still under way. In first place is Kalevi Hamalainen (#1) of Finland with a time of 2:59:06. He is trailed by superstar teammate Veikko Hakulinen (#26) and Swede Rolf Ramgard (#16). Noteworthy on the board is the posted time for American Leo Massa (#5). Joe Pete competed in the 1959 pre-Olympic 15K race, which was held on what would soon become the McKinney Creek Olympic course. He posted the best time by an American in cross-country skiing until Bill Koch shocked the Nordic world with a silver medal in the Innsbruck Winter Olympics in 1976. While this race was certainly a highlight of Wilson’s athletic career, it was participating in the Olympics themselves, which were even more memorable. “Imagine a young kid, wet behind the ears,” says Wilson. “It is difficult to understand what it means to make the Olympic team until you stand in the opening ceremonies and realize you are representing your country,” he says. Even after all these years, Wilson’s eyes still light up with excitement when he talks about his Olympic days. He competed in the 30K Olympic race at the McKinney Creek course. “I loved the trails, they did an outstanding job capitalizing on the terrain and it was exciting as hell,” Wilson says. After nearly 40 kilometers of racing, the men’s 4 x 10-kilometer relay was decided in the final 100 yards. After trailing Norwegian Hakon Brusveen (left) over much of the anchor leg of the relay course, Finnish superstar Veikko Hakulinen surges toward the finish line with a furious double pole stride. The Olympics were only the springboard for Joe Pete’s later accomplishments. After the Olympics, he spent four years in the Army, competing on the United States Biathlon Team. 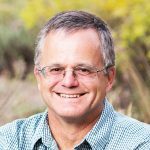 Ask him about biathlon, and Wilson is happy to entertain you with details on how biathlon was derived from ancient hunters who traveled over the snow with skis on hunting expeditions. After the Army, Wilson moved to Stowe, Vt., where he established the first official cross-country ski center in America. It was called the Trapp Family Lodge and boasted 15 kilometers of trails. Later, he moved back to the Lake Placid area and ran The Barkeater Inn, which also had a system of cross-country ski trails. In the mid 1970s, Wilson co-wrote a book about cross-country skiing entitled “Complete Cross Country Skiing and Ski Touring” with William J. Lederer. The idea came to him when Lederer, who was a writer, asked Wilson to teach him how to cross-country ski. “We wrote it together. I would write down the details of skiing, and then we would sit down together and make it clear and concise,” said Wilson. Wilson also started the Cross-Country Ski Area’s Association, giving the rapidly expanding list of cross-country ski areas throughout the United States an opportunity to exchange ideas and better serve their clientele. He worked to design a system of teaching and certifying cross-country ski instructors. And, he performed the initial surveying for the trails at Mount Van Hoevenberg, which later were used in the 1980 Olympics, as well as becoming a popular cross-country skiing destination. But when I spoke to Wilson, what was the thing that really chocked him up with pride? The fact that he was in the stands in both 1960 and 1980 when the United States Hockey Teams won their gold medal matches in Squaw Valley and Lake Placid. Wilson has been back to Tahoe frequently, and has been a big supporter of the efforts of David Antonucci to honor and protect the trail system where the Olympic races were held at Sugar Pine Point. 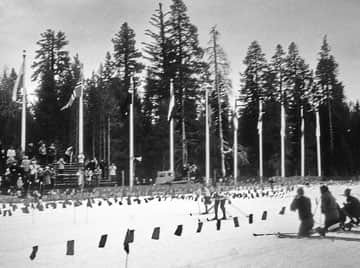 While it’s been more than 60 years since Wilson raced those 30 tough kilometers along Tahoe’s West Shore, he remains an important supporter of cross-country skiing.